Sell merchandise, food, drinks, tickets and much more! It is a solution designed to increase sales of your family entertainment center, game room, bowling or park by allowing your customers to pay for their purchases with a debit card. 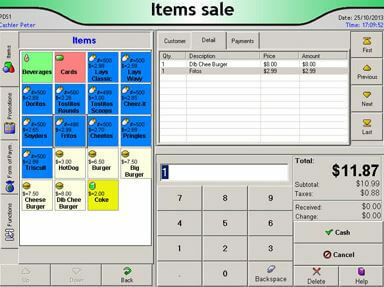 Fully configurable POS System adapts to your needs flawlessly. Set up your system to sell food, beverages, tickets and any service that your business offers. Mobile POS enables your sales staff to bring the retail experience to your customer. Sale, recharge and check guest´s card balances on the mobile POS. Long lines at the checkout counter are history! Get your business moving with promotions, discounts and bonus for your guests. Book parties on the go, make your guests members and achieve brand loyalty. Never miss a sale. Process payments everywhere.